Download "Jersey: for Trusts. Jersey s finance industry provides the highest standards of administration for trust structure"
3 New York, London, Tokyo and Hong Kong to provide tailored solutions. In addition to lawyers, professionals in Jersey work closely with accountants and tax advisers to ensure that structures established are in accordance with any tax advice being given to the client and that the structure is robust enough to accord with tax advice. 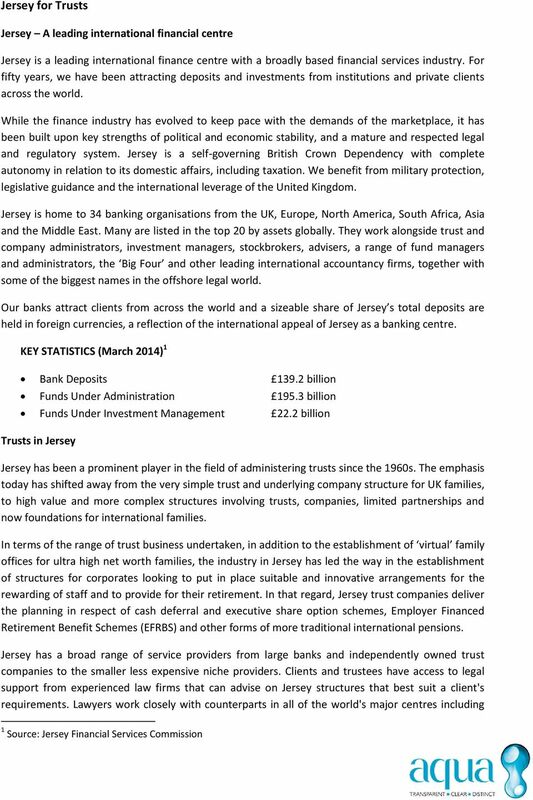 Trusts remain at the heart of the service offered by Jersey trust companies. The type of trust will depend on the client s requirements; so for instance, practitioners will regularly administer fully discretionary or life interest trust or reserve power instruments where the settlor has reserved certain powers to himself. In the employee benefit field, trusts continue to be the core plank in the Jersey offering, whether it be share or cash based incentive schemes or international pensions. Types of Trusts Discretionary trusts and interest in possession trusts Reserved powers trusts (where the Settlor reserves to himself or herself certain powers, rather than entirely vesting them in the trustee on establishment) Unit trusts (including property unit trusts) Charitable trusts Non-charitable purpose trusts (these trusts have an additional requirement of an enforcer whose role is to enforce the purposes) Accumulation and maintenance trusts (used where funds are being set aside for minor beneficiaries such as grandchildren) Tax Status There is no Jersey tax for non-resident beneficiaries on capital gains, bank interest from Jersey-based accounts and non-jersey sourced income. Registration There are no registration requirements for Jersey trusts. Perpetuity Period There is no rule against perpetuities for a Jersey trust. A Jersey trust may continue in existence for an unlimited period. 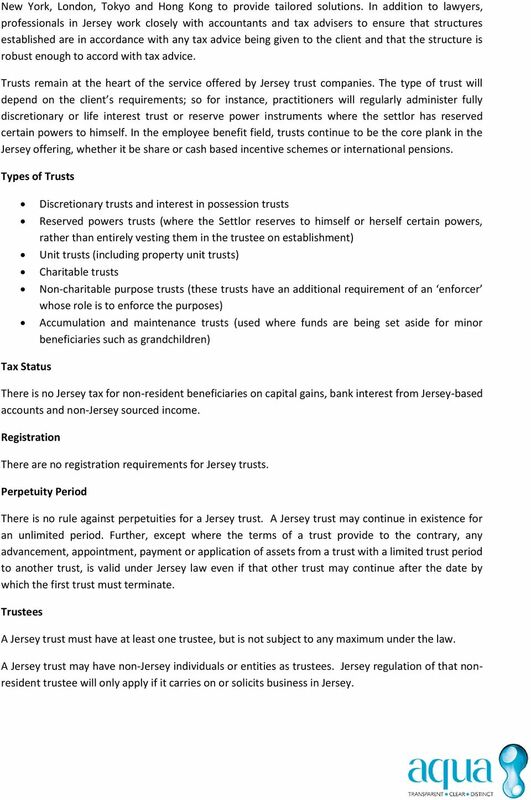 Further, except where the terms of a trust provide to the contrary, any advancement, appointment, payment or application of assets from a trust with a limited trust period to another trust, is valid under Jersey law even if that other trust may continue after the date by which the first trust must terminate. Trustees A Jersey trust must have at least one trustee, but is not subject to any maximum under the law. 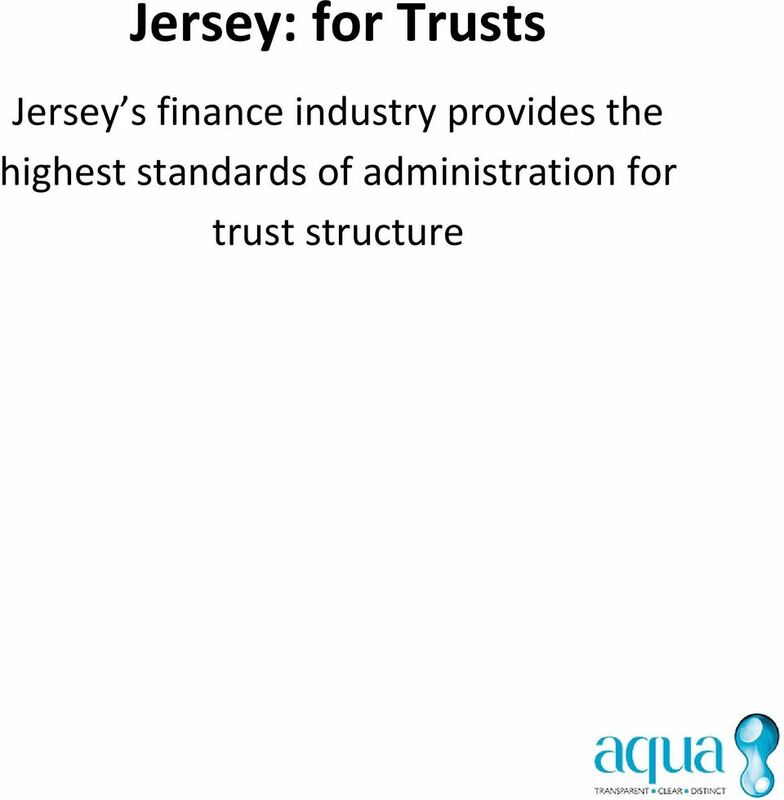 A Jersey trust may have non-jersey individuals or entities as trustees. Jersey regulation of that nonresident trustee will only apply if it carries on or solicits business in Jersey. 4 Private Trust Companies Private trust companies ( PTCs ) are commonly used in Jersey and are subject to lighter regulation than professional trust companies. PTCs (that is, Jersey registered companies who provide certain trust company business services in respect of a trust or trusts) are exempted from having to obtain a licence to carry on that trust company business if the PTC does not solicit from or provide trust company business services to the public and its administration is carried out by an entity that is registered to carry out trust company business in Jersey. Protectors Protectors are permitted and are commonly used in Jersey trusts. Financial Disclosure Jersey law requires that trustees must keep accurate accounts and records of their trusteeship. Trustees are required to disclose to beneficiaries (who are not charities) any document which relates to, or forms part of, the accounts of the trust. Confidentiality Trustees are under a duty to treat information relating to the trust confidentially: the principal exception to this is if they are subject to an order of the court in Jersey. Jersey Financial Services Commission Jersey Financial Services Commission (JFSC) is a statutory body corporate, governed by a Board of Commissioners. It is responsible for the regulation, supervision and development of the financial services industry. A member of the International Organisation of Securities Commissions (IOSCO), the JFSC maintains its independence as a regulator but works closely with those in the industry, with Jersey Finance and the Government. Ever evolving, the regulatory emphasis is now on the entities which are regulated to conduct trust company business under the Financial Services (Jersey) Law In 2009, Jersey received renewed independent endorsement for the quality of its regulation and legislation, the transparency of its regulatory processes and the robustness of its banking system from the International Monetary Fund (IMF), who conducted a comprehensive review. 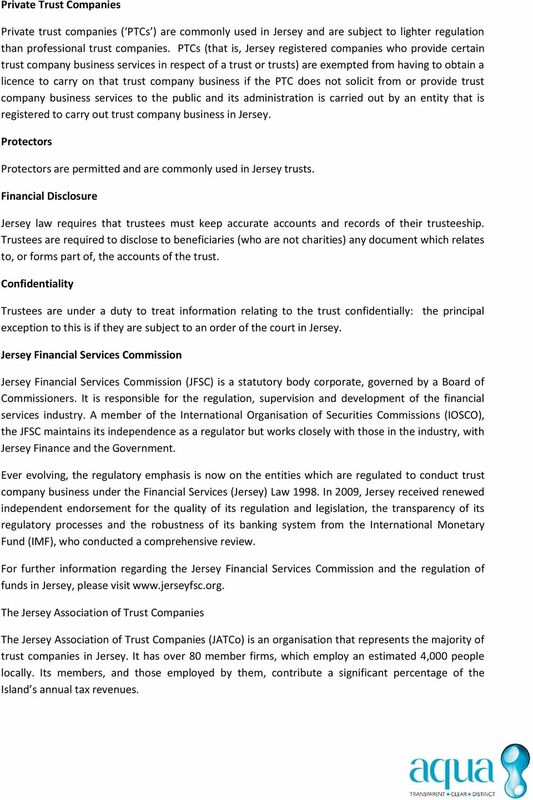 For further information regarding the Jersey Financial Services Commission and the regulation of funds in Jersey, please visit The Jersey Association of Trust Companies The Jersey Association of Trust Companies (JATCo) is an organisation that represents the majority of trust companies in Jersey. It has over 80 member firms, which employ an estimated 4,000 people locally. Its members, and those employed by them, contribute a significant percentage of the Island s annual tax revenues. 5 JATCo represents its members interests to government and financial services regulators. It also runs an education programme to enable decision makers and opinion formers (both locally and further afield) to have critical information upon which to make decisions affecting the jurisdiction s trust industry. JATCo canvasses its members opinions and informs members about developments within the industry, be they technical, regulatory or of a practical nature. It holds forums and seminars on current topics of interest as well as sending regular newsletters to members. Licensing by the Jersey Financial Services Commission is a prerequisite of membership. JATCo s members range from small locally owned trust companies to large multinational financial services providers. The Association s Committee reflects this mix and includes members of the Trusts Subgroup of the Jersey Bankers Association and members of the Jersey Branch of the Society of Trust and Estate Practitioners ( STEP ). Jersey Finance Jersey Finance promotes and leads the development of Jersey as an international finance centre. It also co-ordinates the consultation process for proposed legislation and regulation affecting the finance industry, to produce and maintain a product offering that reinforces Jersey's position as an international finance centre of excellence. The organisation's primary objective is to communicate the many factors that make Jersey a leading international finance centre, including the experience and expertise of its practitioners; its political, economic and fiscal stability; and its high level of regulation and security. Jersey engages regularly with key markets around the world. Jersey Finance has representative offices in London, Hong Kong, Abu Dhabi and India. 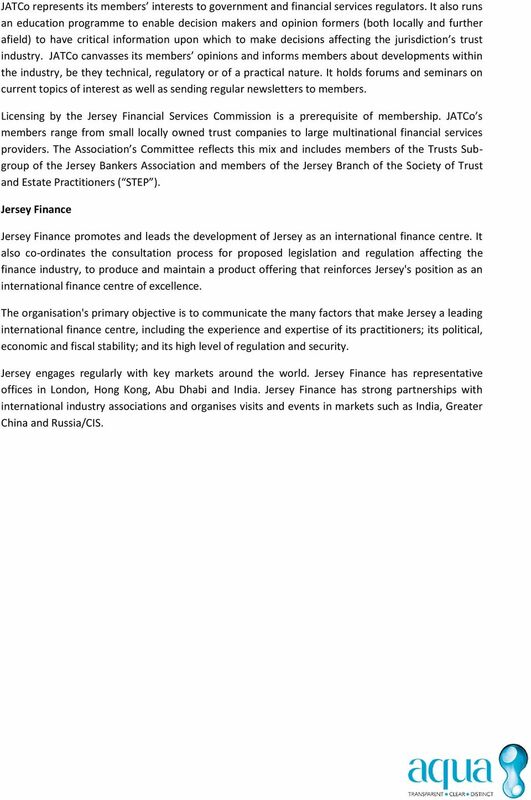 Jersey Finance has strong partnerships with international industry associations and organises visits and events in markets such as India, Greater China and Russia/CIS. CYPRUS INTERNATIONAL TRUSTS. A. THEORETICAL BACKGROUND Cyprus International Trusts very much follow the way UK trusts operate. BRITISH VIRGIN ISLANDS TRUST LAW www.mmgtrust.com table of contents GENERAL INTRODUCTION 3 NOTES 4 WHAT IS A TRUST 5 THE USE OF TRUSTS 6 WHAT IS A BVI TRUST? 6 MIGRATION OF TRUSTS 7 WHO MAY BE A SETTLOR? Reserve Advance For advisers only. Not for use with customers. Non-dom dilemmas and how offshore bonds can help. For advisers only. Not for use with customers. Deliver benefits that are valued, cost efficient and help you attract, recruit, motivate and retain your employees. RBC INTERNATIONAL Pensions and Savings Solutions INTERNATIONAL Pensions and Savings Solutions Deliver benefits that are valued, cost efficient and help you attract, recruit, motivate and retain your employees.